A kitchen is more than just a place to cook, it’s a place where family gather. We at London West Builders can help you to find the perfect kitchen. We do it as an Art. Our designers consider your complete lifestyle. Building kitchens is more than placing cabinets, doing plumbing work and integrating appliances. We consider your vision of the kitchen in your life, your family size and provide space for every insight to your lifestyle. It is all about the design that makes your kitchen a great kitchen and fulfilling. We have years of experience in remodeling and also to make new inspiring kitchen. 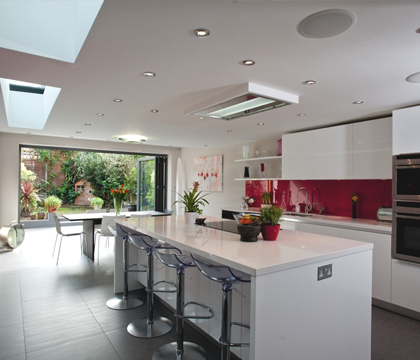 Our designers can create or remodel your existing kitchen with all the space and upto your expectations. We make kitchen where a child can have entertainment and you will love to cook and everyone grabs the meal quickly. Bathroom is a room of oasis to recharge and rejuvenate ourselves from our daily lives. The designers in London West Builders create a splash of bathroom designs. You can have your own space at bathrooms. It is more than a utility room where one can relax, unwind or have a rain shower. At London West Builders we have features to style your bathroom by setting up a spa tub where one can relax. We can also take your ideas and create space for kids bathroom, dressing room and guest bathroom. We are experts in renovating or remodeling or building your new home with plenty of designs in kitchen and bathroom with excellent products and services. We cover with more creative designs. You can be stress free and beyond everything we see all your ideas flowing and build bathrooms according to your needs. Stop at our designs and enjoy the vignettes of bathroom.